We have a friend staying with us that has never really cooked. As we were watching the Master Class episode of Masterchef New Zealand they made this Tart Tatin and it seemed like something easy for our friend to tackle in the kitchen. After all, she’s been watching me bake for the past couple of weeks and we did puff pastry while she was here. Josh Emmet tells us that Gordon Ramsay taught him how to make this dish. This is the image of what ours came out like. It needs to be darker but we’ll discuss that in the rest of the article. I will tell you that I cheated on this and bought the puff pastry in the frozen section of the grocery store. I doubt that I will ever do that again. Having made my own puff pastry the quality and flavor is superior to the store bought. It’s time consuming to make puff pastry yourself but just follow my recipe and you’ll love it. 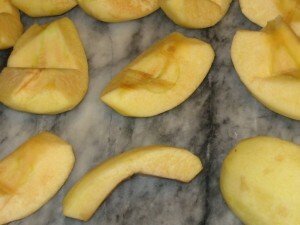 Peel and quarter your apples as much as a day ahead of time and refrigerate to allow them to dry out some. They will turn brown but that’s okay. 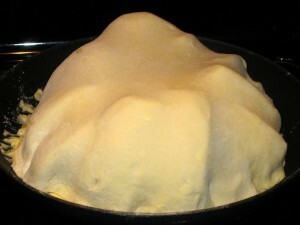 Place the butter in the base of a cold, ovenproof pan. 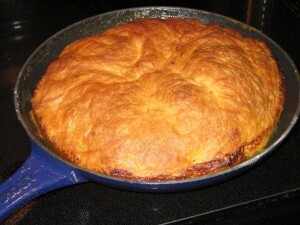 We used a Le Creuset Omelet Pan that was 10-inch/25-cm at the top of the circle. 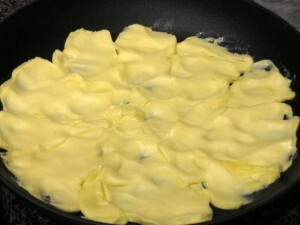 Press the butter down into the bottom of the pan. Place two of the apple quarters in the center of the pan on top of the butter and sugar, and arrange the rest of the apples around, neatly overlapping. Leave room around the outside of the apples to tuck the pastry into. As I watched this episode a second time to see what I did wrong, I noticed that Josh put his apples in with the curved outside edge toward the middle. 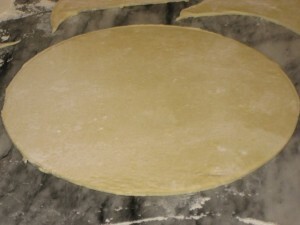 Use a cutter or knife to create a circle of puff pastry which is slightly bigger than the pan used for the tart. If your pastry gets warm put it back in the refrigerator. 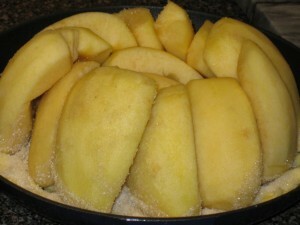 Place the pastry over the top of the apples and tuck the edges tightly down inside the pan. Place the entire pan in the refrigerator to get the pastry cold again. You can prepare this several hours in advance of cooking. 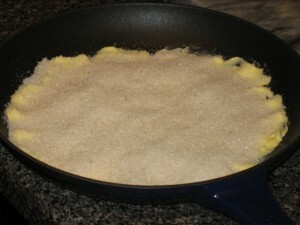 Place the pan over medium high heat on the stove top. 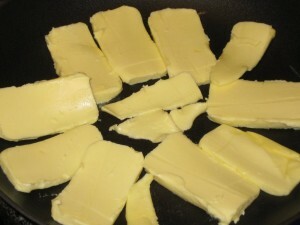 Allow the butter to melt and the sugar will start to caramelize. 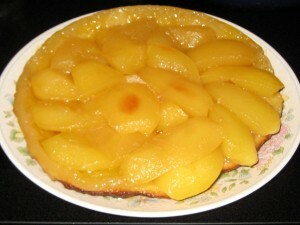 Carefully move the butter around the pan without disturbing the apples to get a coating on the edges of the pastry. Leave on the stove top for approximately 8 minutes. The sugar caramelization is the important part of this dish. Our finished Tart Tatin is pale in color because we did not let the sugar caramelize enough on the stove top before putting the tart in the oven. Brush the top of the tart with the melted butter and use a knife to create small holes in the pastry for the steam to escape. Place in the oven for approximately 1 hour and 15 minutes or until the apples are well cooked and the pastry is puffed and golden. We checked ours at 30 minutes and the apples were very soft and pastry golden so we removed it from the oven. I think if we would have baked it the entire time our apples would have been mush. Peel apples a day in advance to dry them out. 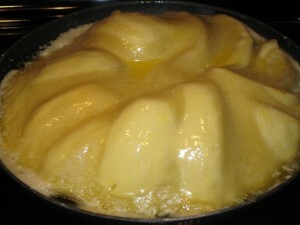 Bring the tatin up to the caramel stage on the stove top before putting in the oven. Use the back of a spoon to tighten the pastry around the the outside of the apple.